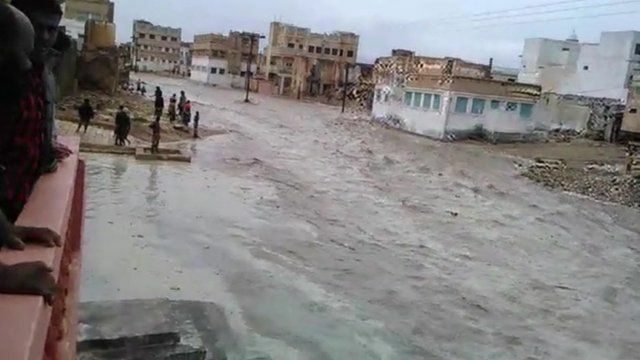 Sana’a/Beirut, 28 April 2016: Heavy rainfall has caused flash floods and landslides in several parts of Yemen, displacing people and destroying homes and livelihood. Yemen Red Crescent Society assessments indicate that close to 30,000 people are affected and more than 1,000 homes are destroyed. “Communities are suffering from the armed conflict, two consecutive cyclones and now heavy rainfall and flooding, all in just one year. Coping mechanisms have been exhausted and the response capacities of our branches and volunteers have been stretched to their limits,” said Mr Fuad Al-Makhedhi, Secretary General of Yemen Red Crescent Society. Entire communities have been cut off as a result of inaccessible roads and landslides. Even as floods have receded, stagnant waters have been left behind, raising concerns of the spread of malaria and dengue fever. “The governorates most affected are Abyan, Amran, Hajjah and Hodeidah, where urgent needs include safe drinking water, food, shelter, health assistance and hygiene items. Together with our Movement partners, we are doing the best we can to reach out to those in need as quickly as possible,” added Mr Al-Makhedhi. The International Committee of the Red Cross (ICRC) and the International Federation of Red Cross and Red Crescent Societies (IFRC) are supporting Yemen Red Crescent Society, whose teams on the ground are at the forefront of emergency response to the humanitarian challenges caused by this most recent crisis. Amran, Hanahah, Qarameshah and Al-Melh mountain of Hodeidah, Al-Makhader district of Ibb, and Wadi Shares of Hajjah are among the locations where Red Crescent teams have been providing assistance. Almost 9,000 people affected by the floods have received food parcels and 4,000 people displaced by the rising waters were provided with household essentials including hygiene items. “While the recent rainfall and flash floods have heightened the suffering of Yemenis, it is important to keep in mind that the country’s conflict has been ongoing for a year and has played havoc with people’s lives. It has been the primary reason for loss of life and the spike in humanitarian needs,” commented Mr Alexandre Faite, Head of the ICRC delegation in Yemen. Further distribution of relief and ongoing assessment of needs following these floods will continue, with humanitarian activities relating to the conflict in Yemen being delivered in parallel.